One of the most common problems Giving Gardeners have is getting others in their P-Patch (or other community garden) to participate in the Giving Garden program and donate their extra produce. We all know how frustrating it is to see beautiful produce bolt or rot on the vine instead of being harvested for people who could really use it! 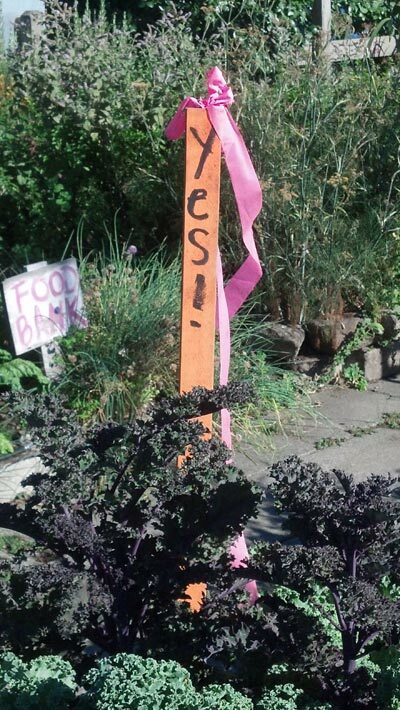 However, you can’t harvest from people’s plots without permission, and besides, that’s not the point: you want to create awareness about your Giving Garden and develop a culture of generosity in your P-Patch. This is an ongoing process that takes time and patience, but there are a number of things you can do to speed things up and get gardeners on board. Never assume that people know what the Giving Garden is, who you are and what you do. You have to be a friendly, energetic ambassador in your garden and your community, publicizing your project all the time. Talk it up at the gardener gathering at the start of the season! Tell everyone what you’ve been doing, let them know what kind of help you need, hand out extra seeds and encourage people to grow an extra row for the hungry. If you don’t have a pre-season gathering, print up a simple information sheet to hand out to people when you meet them. People are impressed by numbers, so make sure everyone knows how much you donated last year, what your total donations are to date, how many people your produce fed, etc. Post the season’s cumulative Giving Garden totals on a whiteboard and display it in a visible part of the garden so everyone can be proud and share in the program’s success. Put regular items in your P-Patch newsletter, if you have one. Remind people how and when to donate, invite them to work parties, etc. Nothing beats face-to-face contact! If you see someone working in a bed with rows of lettuce about to bolt, or more kale and zucchini than they will ever eat, be assertive and friendly. Go up and introduce yourself and ask – respectfully – if they would be interested in donating some of that extra produce, or if they would like someone from the Giving Garden crew to harvest it. Make creative gleaning sticks! Buy or scrounge 5’ lengths of lumber (1”x 1” or 1” x 2”), paint the sticks bright neon colors and write “YES!” on them in black. Staple colourful plastic ribbon to the end. You can also use bamboo poles with bright flags or bits of fabric. Make the sticks as fun and visible as you can. Keep them in one place, then get out the word and tell gardeners to plant a stick in their plot where extra produce may be harvested. Ideally, people will do their own harvesting, but that’s not always possible, especially when gardeners are away on vacation. Plus, you want to make it easy for them, so you and your Giving Garden crew need to be ready and willing. Make sure you know EXACTLY what the gardener wishes to donate. Ask people to contact you (in whatever way makes most sense for you) after they have planted the gleaning stick to tell you what to harvest, e.g. all the beans, every other lettuce, 50% of the kale, etc. Organize “Gleaning Days” in the garden, monthly or as needed, and make a party of it! Delegate someone to be the “Glean Queen” or “Glean King” and put this person in charge of harvesting produce from plots with gleaning sticks in them. Some gardeners may be willing to agree up front to regular light gleaning (emphasis on the “light”!) throughout the season. Most people won’t notice what’s missing, but make sure you have express permission before you glean. Every community garden is different, so use whichever of these tips is likely to help. It’s also a good idea to sit down with your co-gardeners and volunteers and brainstorm creative strategies for your own Giving Garden. Whatever the case, remember that this process is an exercise in patience and repetition – just like gardening.